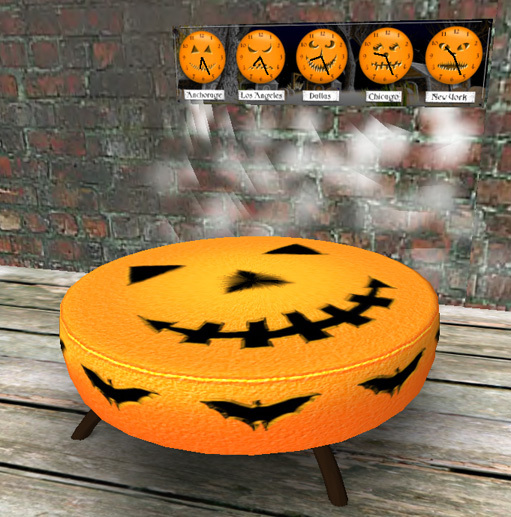 Halloween is a HUGE holiday in SL — I know the lengths we went to last Halloween…and this year could be even bigger. 🙂 We’ve started decorating the sim, so I’ve been keeping my eyes open for cool decor, and I’ll share what I come across with you, dear readers. Here’s the first batch! That’s Spider Venom, Zombie VIrus, and Ghostly Spirirts. Ooooohhhhhh! $250L each, and perfect for your Halloween party(ies)! These are so cool — Horror Changers! 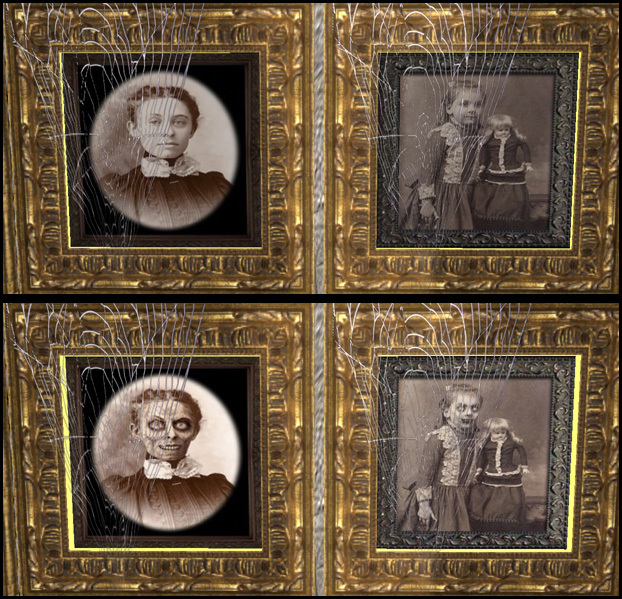 That’s before/after from top to bottom — the pics change magically every 10 seconds or so. Casandra has just a ton of these — $100L each, or you can pick up an entire gallery. Greene Concept Furniture: Peter Stindberg has released a Halloween version of the Berlin Sofa, as well as special edition of the Quintos Chronometer. Very cute! 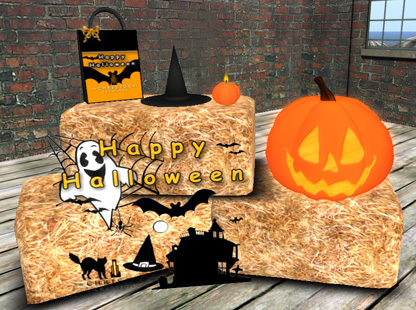 Christos Creations: Christos Atlantis has a freebie pack of Halloween goodies available at his main store. I love the wee pumpkin candle! I had a few review copies sent to me about 2 weeks ago from Ivanova Shostakovich and Peter Stindberg of Greene Concept Furniture. I went ahead and popped into their shop, too, to see what I could see – the inventory is limited at this point to just the two pieces below, but there are quite a lot of textures available for each piece, so I’d say it’s worth a look. The first piece is the Berliner Stool. Ivanova and Peter also tout it as a ‘sofa without backrest’. I could see it used as seating alone, or even as an overly large ottoman with a coordinating chair or sofa. It’s only 4 prims, which is great, and seats 4 people. From what I could tell in the store, the price of the Berliner varies depending on the fabric you choose: I saw $700L and $250L options – denim, cotton, suede, and a few more. The other piece is the San Jose Bench. I do like the shape of this; it’s a bit different without being TOO different. As with the Berliner, the San Jose is available in a multitude of fabrics, which seem to be split into either $800L or $300L options. The piece is only 7 prims — again, awesome — and seats 5 avatars. The textures are good quality — the tufting on the San Jose is really nice and very realistic, a well as the piping around the edge of some of the Berliner texture options. I also really like how the available textures are displayed. 🙂 Dear readers, you know I’m a sucker for a clever display! Thanks to Ivanova and Peter for sharing. Get over to Greene Concept and try ’em out!